I was hunting for line dance lessons on the internet when I happened upon the website for the Cookeville Senior Citizens Center. There it was, Tuesdays at noon, beginner line dancing. But something else on the center’s long list of activities caught my eye. Table tennis. Instantly, my mind harkened back to happy childhood days when almost everyone in my neighborhood had a ping-pong table in their carport or rec room. When the weather was too rainy to play outside, my friends and I played ping-pong instead. It wasn’t until years later that I learned the proper name is “table tennis.” The game originated in Victorian England as an after-dinner parlor game. In its infancy, it went by several different names, including “whiff-whaff.” In 1901, J. Jaques & Son trademarked “ping-pong,” which they later sold to the U.S. company Parker Brothers. The company soon began enforcing the trademark. That’s why the generic term “table tennis” has become the accepted name for the sport. Only those who’ve never played table tennis laugh when they hear it called a sport. They clearly don’t know that table tennis demands muscular and cardiorespiratory endurance, nimble footwork, upper body flexibility, intense hand-eye coordination and faster response time than tennis or badminton. 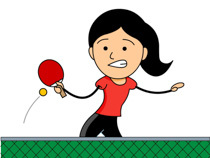 Table tennis also helps keep the brain sharp by requiring mindfulness, focus, and constant strategizing. It became an Olympic sport in 1988. Rules and equipment have changed radically since the game started. Back in the olden days, you had to score 21 points to win a game. But in 2001–to make the game more fast-paced and exciting–the winning score was reduced to 11, with the rule remaining that a game must be won by at least two points. The serve rotation has been lowered from five serves per player to two. And in order to reduce the server’s advantage, the ball must now be tossed at least six inches into the air before it’s hit. Equipment has changed, too. In the early 1900s, table tennis enthusiasts began using a celluloid ball and invented the modern racket—called “bats” in England, “paddles” in America, and “rackets” by the International Table Tennis Federation—by fixing a sheet of pimpled rubber to a wooden blade. These days, table tennis balls come in two colors (white and orange) and are graded from one to three stars. Only those balls approved by the ITTF can be used for official tournament play. Competition players use paddles covered with a rubber sheet combined with underlying layers of sponge, which dramatically affects speed and spin. Some are smooth on one side and have raised “nibs” on the other. High-end table tennis rackets can cost hundreds of dollars. I didn’t have any fancy equipment when I walked into the Senior Citizens Center a couple of months ago. In fact, I had no equipment at all. To learn the rest of the story, tune in next week.